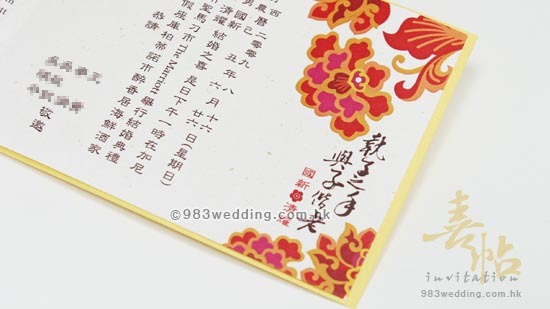 The design of this wedding invitation comprises traditional paper cutting patterns with smilingly double happiness symbol. The main theme and concept are to celebrate the joy of getting married. 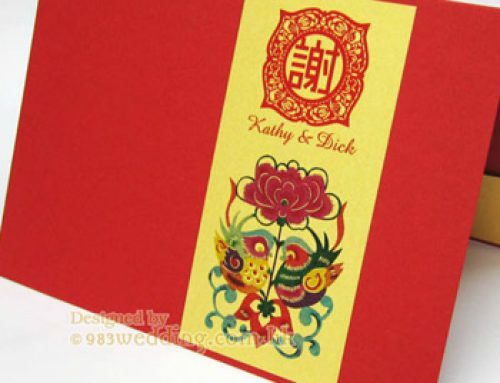 Red color blossomy flowers are used to add more Asian taste to the wedding invitation design. 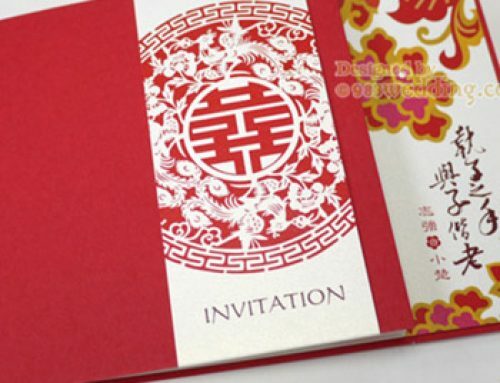 This is another unique design of Chinese wedding invitations. Again, it is not an extremely traditional one. Without any surprise, it is a modern one with interesting design elements. 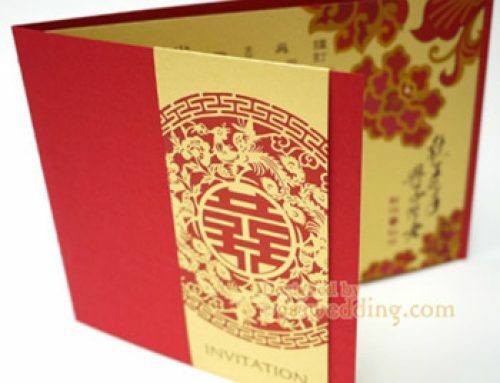 Gold and red colors are used as the main colors of the cover in order to create this modern Chinese design. The paper of the cover is gold in color. 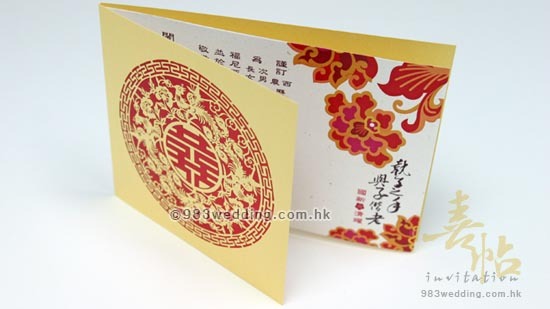 On the cover, a double happiness pattern (paper cutting pattern) is printed with red color foil. The red and gold colors on the cover create both wonderful color contrast and a taste of Asian or Chinese design. The double happiness looks like a smiling face. This denotes that a wedding is should joyful and happy. There are also phoenixes on the pattern. This reinforces the idea of celebrating the wedding. 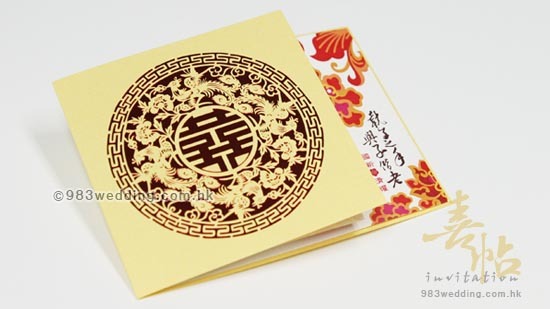 The treatment of the insert is also of modern Chinese style, of course. The insert color is off-white. We do not choose colors such as red mainly because we do not want to make it look too traditional. Red and light brown color patterns are printed on this insert. They are actually some abstract Chinese floral patterns. The phrase “執子之手 與子偕老” is printed on the insert as well. This is in fact a very romantic Chinese phrase. It means that the couple will hold the hands of each other. They will also become old together (This actually implies holding each other’s hand for the rest of the life). This idea is really very romantic as it states and implies the notion that the couple will be together forever. The names of the bride and groom will also be printed beside the phrase. The insert is glued to the cover inside. There are usually two options for the envelope. It can be either gold or red in color. This will match the main design of the invitation. 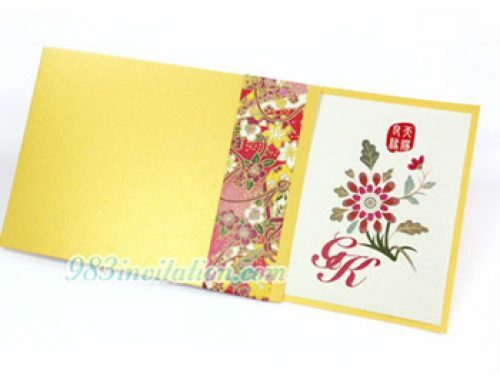 Of course other colors of envelopes can also be chosen. 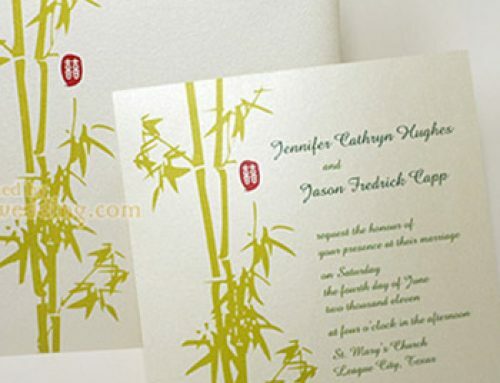 For instance, some brides and grooms may want to use an envelope which is ivory in color. insert with full-color printing on ONE side. Insert glued on the card inside.